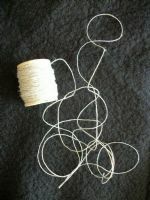 Linen Thread is a great natural thread to use on your craft projects. It is made from 100% flax. The thread I have is a natural color. I use this for hair, whiskers, boot laces and a lot of other things. It stains beautifully! I have wrapped 25 yards onto an old wooden spool. $5.00. FREE SHIPPING IN 48 U.S. Others E-Mail me for shipping charges.